« After ISIS ‘defeat,’ what comes next? Progress of SDF can be clearly evident on @sentinel_hub imagery of #Baghouz from 21.03.2019. New burn traces on the land patch next to thw river, and vehicle tracks more evident as front moves closer. 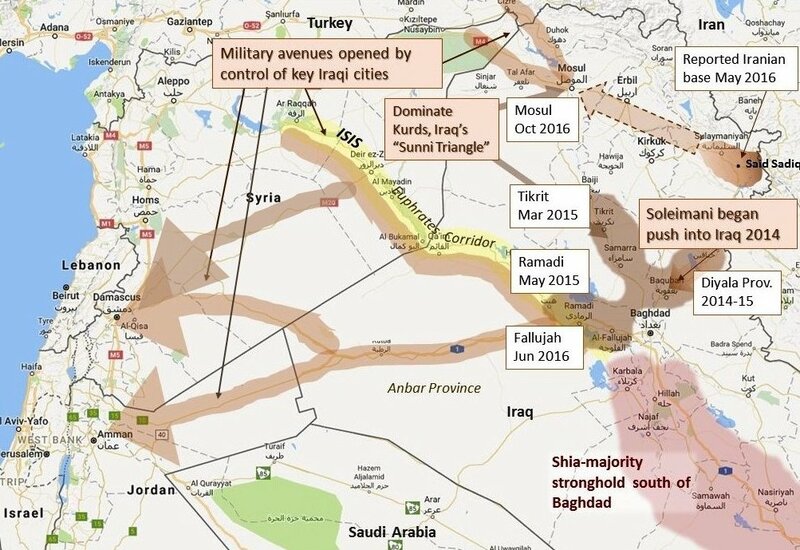 The main point I made in 2017 was that the U.S, if we wanted to stabilize the region, needed to “block the center” of Iran’s land approach to Syria and the Mediterranean. It wouldn’t be good enough to hold territory through allies (i.e., the Kurds) to the northof the center, in Raqqa. 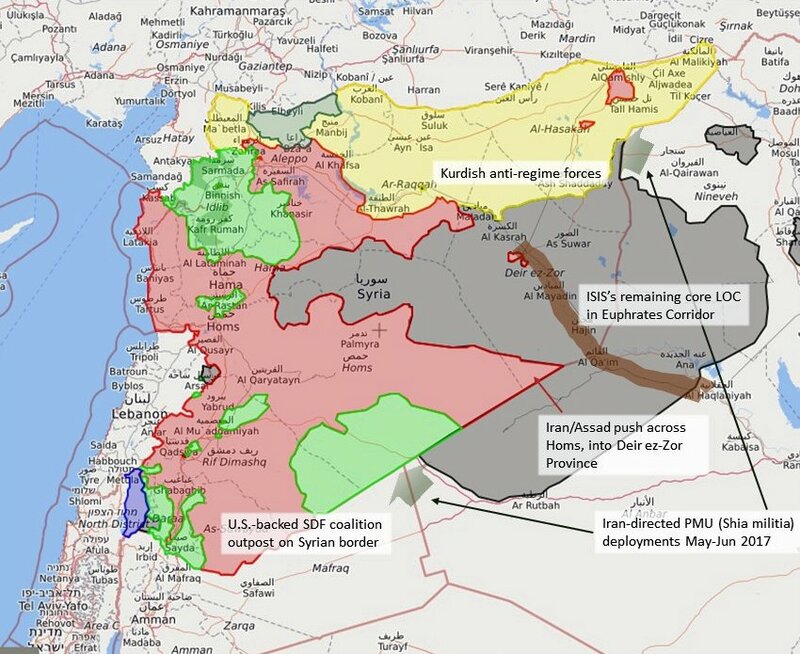 Even if our allies – Syrian coalition forces – also held territory south of the center, on the border with Jordan, leaving the Euphrates Corridor that defines the center of the land bridge to Iranian dominance would be unsustainable over time. The U.S. did three important things in 2017-2018 that shifted the correlation of forces, including the combat momentum, in our coalition’s favor. One, we made it clear with less than a handful of tactical demonstrations that we would not allow Russia to interferewith our coalition’s operations south of Deir-ez-Zor. Russia did not, it turned out, want to push the point in that area badly enough to get into a faceoff. It has been clear for some time now that Iran has been eyeing the Golan as a gateway to military leverage over Israel. 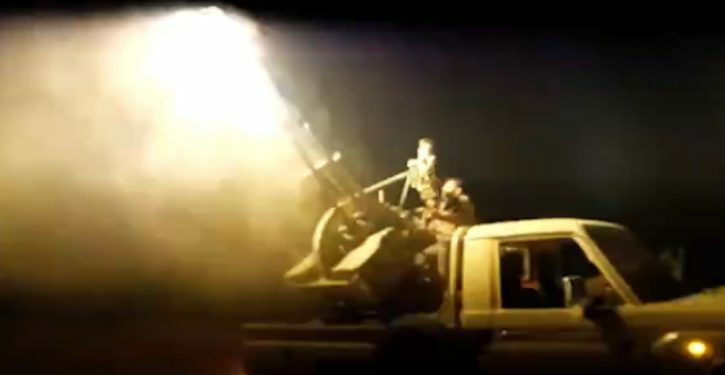 A year ago, Iran was using a group of newly improved bases south of Damascus to support artillery and drone operations that kept “straying” across the UN monitoring zone to menace northern Israel. These events included the intrusion of a “flying bomb” drone into Israeli air spacejust south of the Sea of Galilee. This entry was posted on March 24, 2019 at 3:41 PM and is filed under Uncategorized. You can subscribe via RSS 2.0 feed to this post's comments. You can skip to the end and leave a response. Pinging is currently not allowed. a fantastically written analysis, for which I am deeply grateful, Joseph. why will it shift the momentum significantly? I can not see that in all reality , the status quo stay the same . quote : With U.S. recognition of Israeli sovereignty in the Golan, the vector of geomilitary momentum will shift significantly. Unquote: i,am very happy with this action of Trump , but can somebody explain to me why it shift the momentum significantly.